Kjarsten Christensen participated in the Ride of Silence to honor his friend Brynn Barton. I went to this year’s Ride of Silence reluctantly because I knew that it would be hard for me. A chance encounter with a friend tipped the scale and I went. When the ride stopped at scene of the accident I witnessed, I could barely hold it together. After the ride was over I was asked who I was riding for. After some discussion I agreed to write this first hand account of what I saw the night Brynn was killed. I would first like to start from the beginning of how I met Brynn. I was at a graduation party with friends in a back yard on a May evening. I saw Brynn from across a group of people, our eyes met and we instantly recognized each other because I had sent her a message on Match.com earlier that day. She had not answered me yet so I was feeling awkward. She approached me, we had a few laughs and I got her number. A funny coincidence was that my roommate got her friend’s number without knowing they were connected. Double dates followed. We were so crazy about each other it felt like being in high school again, only I was actually going on dates. Brynn was a nurse in the maternity ward while I worked at a boarding school. Because we both had long shifts with four days on and three days off we would be inseparable for days at a time. We were together for one beautiful summer month. 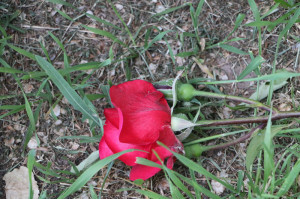 A rose was placed at the corner where Brynn was killed. On June 7th, 2011, Brynn and I were biking with a friend going south on 7th East in the bike lane, lights and helmets on. We were go to a restaurant on State Street to have dinner. It was heavy traffic and I wanted us to switch to a safer street. So I pedaled past Brynn and our friend to get in the front of the group and turn on 8th south. I stopped at the corner to look back up 7th east to confirm that they were following me. It took me a second to register in my mind what I was seeing. A shower of sparks was spraying out from under a car. I realized that it was a bike being dragged. The only other thing I could see was headlights and the silhouettes of cars traveling at 45 mph. I mumbled “oh god” as I dropped my bike and ran the half a block. Brynn was at the beginning of where the solid left turn line starts. Her bike had likely been run over several times by this point as it was all the way in the middle lane. I reached down for her wrist to feel for a pulse as I dialed 911. I gave the address and told the dispatcher that she was not breathing. I couldn’t feel a pulse. I have first aid and CPR training but I was unsure if I should move her to do chest compressions at that point because she may have had a spinal injury. People had finally stopped and blocked the road with their hazard lights on. A woman approached the scene with a blanket and put it over Brynn's legs before saying “oh she's dead” she then left with her blanket. Within a minute of the 911 call, an off duty EMT arrived and took charge of the situation. In under three minutes of the 911 call a fire truck and ambulance had arrived. I really appreciated the speed and professionalism of the first responders so that I could know that everything that could have been done was done. I stood a few feet away, calm and in complete denial as Brynn was being worked on. Within a short time a first responder walked over to me and informed me that there was nothing that could be done for her. As my denial of the situation washed away from me I collapsed and sobbed right there is the street. Police arrived and cordoned off the area as it was now a crime scene. The driver or drivers that had struck Brynn never stopped. The police used phone numbers from Brynn's cell phone to contact her family. This was unnecessary as members of her family worked at the hospital and had heard about the accident already. Brynn's father, roommate and other family members arrived at the scene while she was still on the pavement with a white sheet over her. We hugged and cried. When I got home I broke my helmet on the curb and cried some more. I told the police everything I saw, which was not very helpful. Bystanders claimed that the car that hit Brynn was a dark Volkswagen Passat. That could be true, I don't know. Were they drunk, high, talking on the phone, texting, we will never know. Some person is somewhere dealing with the fact that they fled from a fatal accident and never took responsibility for it. I feel sorry for them. The next morning Brynn's family brought me flowers. Through the whole process they were very supportive and included me in every event. I will always be so grateful to them. Brynn was an organ and tissue donor. Many patients benefited from her generosity, including two people who can now see because of her donation. Three years later and I manage to not beat myself up with survivor's guilt or bad dreams. But the accident still bothers me. People ask me what I would like done to change things. I am not a city planner or an engineer, I don't know what would make cycling safer. I do know that we live in a country with an obesity problem and a city with a pollution problem. I hope that these realities will help engender more cooperation and awareness among everyone who uses public roads. I am also asked about how this experience has affected my life. One way it has affected me is the clothing I wear. People attending Brynn's funeral were encouraged to wear bright vibrant colors instead of black as a celebration of how alive and colorful Brynn was in life. Since the funeral I wear bright colors to remind me to take advantage of every opportunity to live.